I guess the CAN-endar ads sort of started with this little guy. Sir Maculous Fluffington the 41st. Let’s just blame all on this nonsense on him. 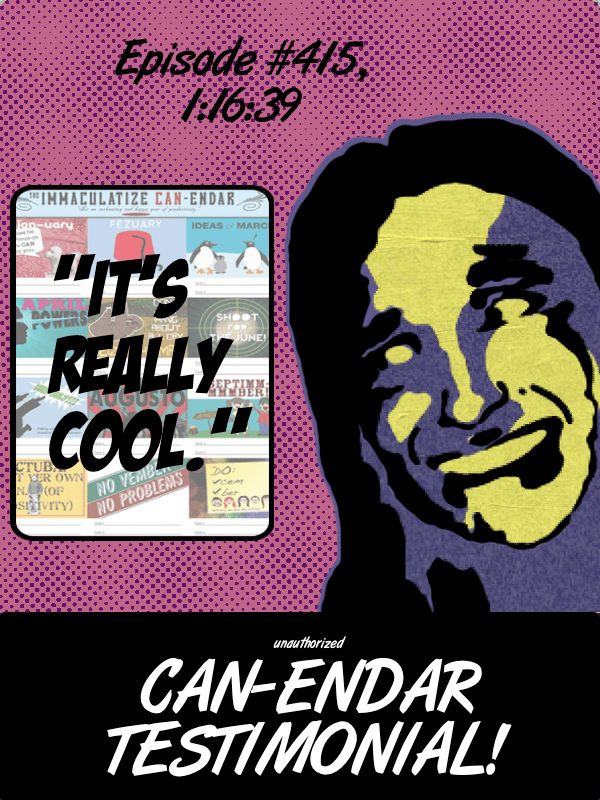 He was so lovable he inspired my first CAN-endar ad. My real dog is jealous by how much I love this guy. Then along came this guy, Sir Awesomus Slothington the 23rd. Just kidding. He doesn’t have a name. He’s a wild sloth. I don’t know him personally. He is also the featured creature in Seize the May! Update: His name is Larry. 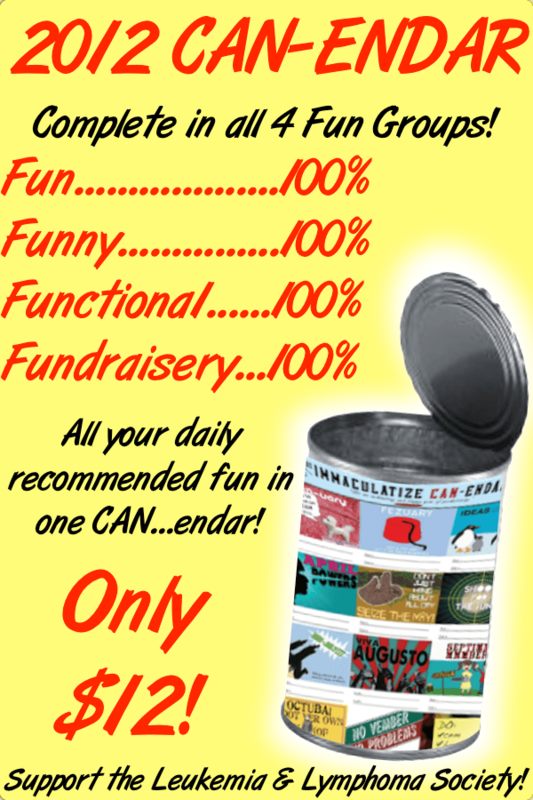 Everyone should stockpile some non-perishable CAN-endars! Where else can you get all 4 fun groups? Clean up in aisle awesome! 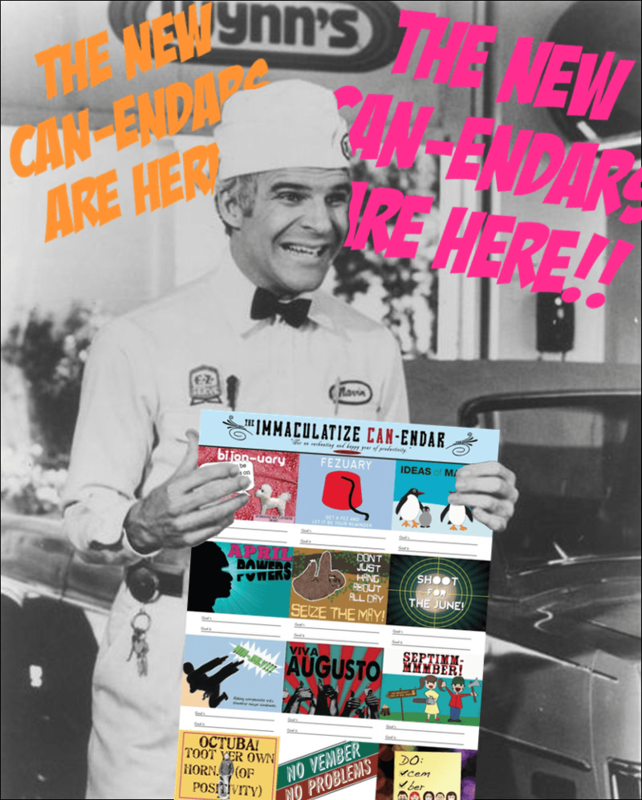 CAN-endars are spilling over with positivity! 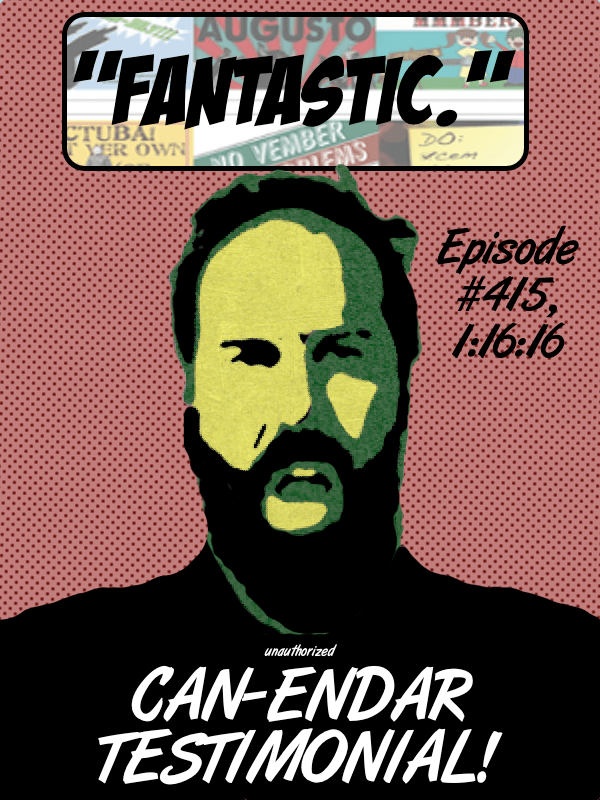 I was truly impressed by how well received the CAN-endars were when they were introduced by Jamie on the The Long Shot (Podcast). Really, I think they sorta liked them. I was so moved I created a testimonial ad for each of the crew and a very special guest. I am very very amused by Sean Conroy’s very very mixed feelings. Sean even commented on his ad with a simple, “Yay.” I think he meant it. The Bitter Buddha, Eddie Pepitone, is blown away by the beauty of Bijonuary! Amber Kenny – she might not have said much but I believe her testimonial was heartfelt. And a very special testimonial from a very special guest, Mr. Brett Gelman! 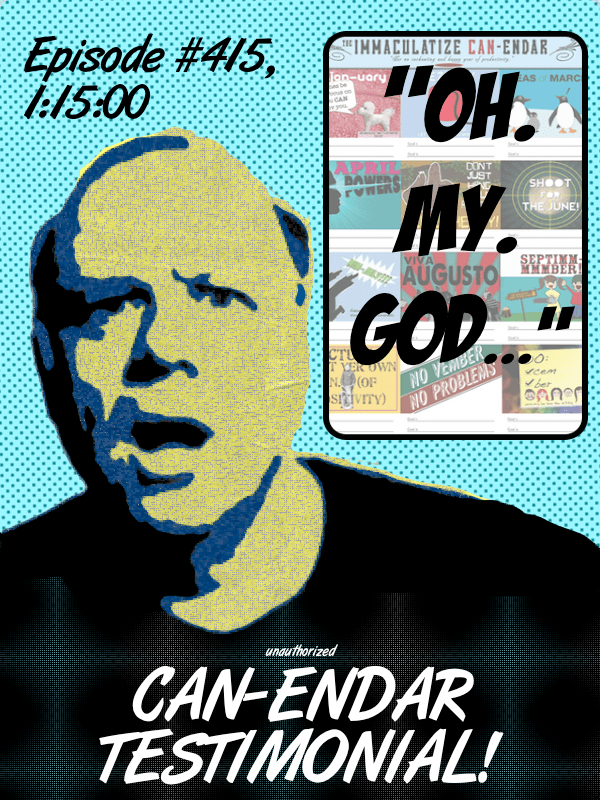 Finally, I had my own Navin R. Johnson moment when the CAN-endars arrived on my doorstep so this just needed to happen. He has his CAN-endar…and that’s all he needs! So there they are. All in one place. A little overwhelming huh? Is your head spinning? No worries. 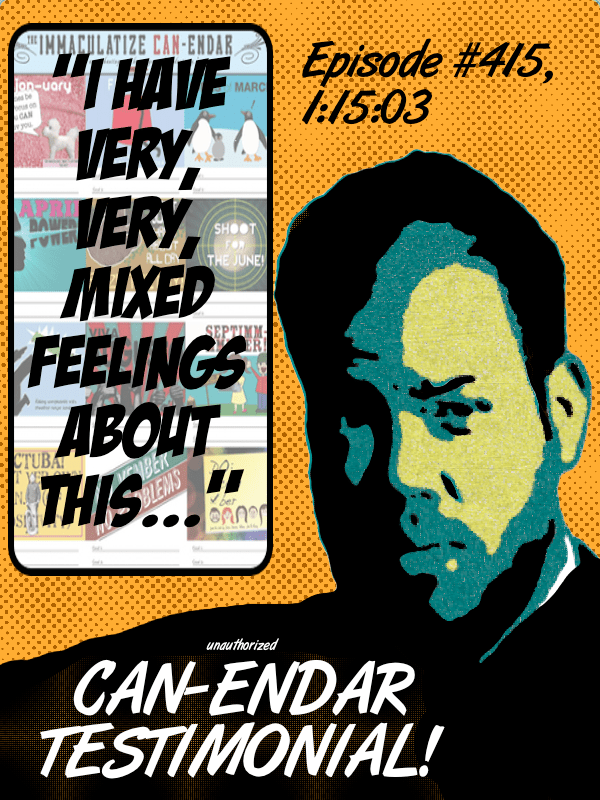 That feeling is just your heart telling you to run out and buy your very own CAN-endar. BUT WAIT! 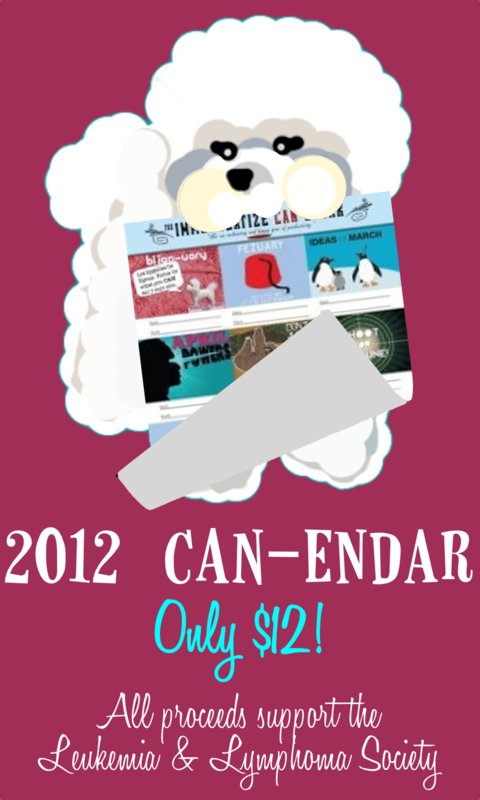 Before you go running out the door you can get your CAN-endar right HERE! 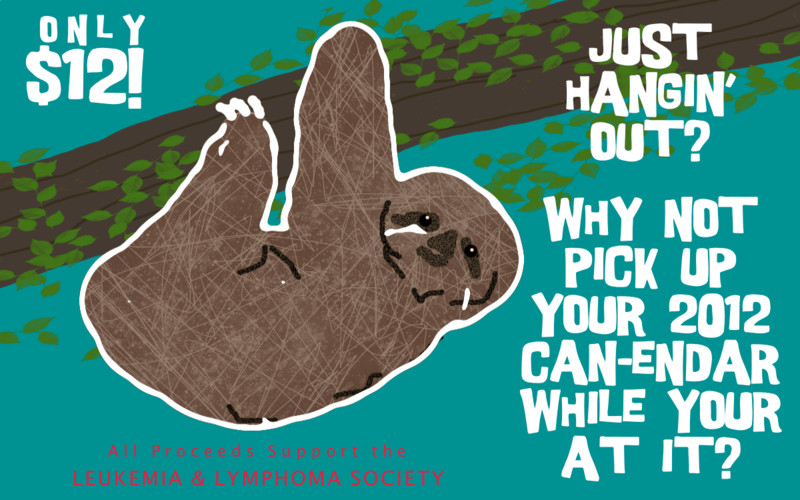 Remember – they are only $12 and all proceeds go to LLS… like you could forget.